Eight governorship aspirants of the All Progressives Congress (APC) in Zamfara state, have faulted the move by the state governor, Abdulaziz Yari to enforce the judgement of a state high court on the Zamfara APC candidates tussle. 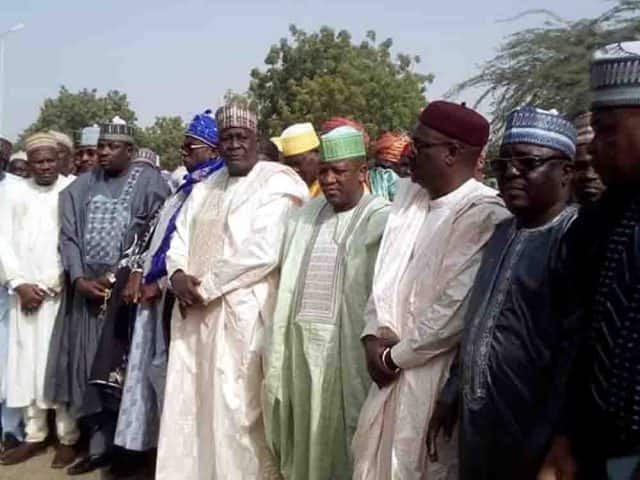 The aspirants including Senator Kabir Garba Marafa, the Zamfara state deputy governor; Malam Ibrahim Wakala, former governor of the state; Mahmud Aliyu Shinkafi, Minster of Defence; Mansur Dan-Ali, Rep Aminu Sani Jaji, Engineer Abu Magaji, Dauda Lawal and Mohammed Sagir Hamidu. The aspirants under the umbrella of G-8, said an application filed on Friday, February 8, by Governor Yari, seeking the interim enforcement of the judgement of a Zamfara state high court on the tussle, was strange to the law. The aspirants, therefore, called for the urgent intervention of the National Judicial Council (NJC) on the matter. The aspirants had formed the G-8, following the crisis that trailed the APC's primaries in the state as Governor Yari has insisted on his faction being the authentic group in the party. A Court of Appeal sitting in Sokoto had adjourned the appeal on APC candidates tussle to Tuesday, February 19 for hearing and abridged the time for the parties to file briefs. Two courts had given conflicting judgments on the matter on Friday, January 25. While a Federal High Court presided over by Justice Ijeoma Ojukwu held that INEC acted within its powers by refusing to accept list of candidates from a faction of the APC in Zamfara state. Another judgement was delivered by Justice Muhammad Bello Shinkafi of the High Court in Gusau, Zamfara state. where he affirmed that primaries were conducted and requested INEC to accept the candidates produced from the primaries. However, INEC on Wednesday, January 30, after studying the two judgments, decided to maintain its earlier position on the matter. Two sets of defendants in the case before the Zamfara state high court, Senator Kabiru Garba Marafa and Hon. Aminu Sani Jaji separately filed notices of appeal against the judgment. The members of the G-8 in a statement said: “It has been rumored that shortly after the adjournment the 1st- 38th respondents in this appeal (Governor Yari’s camp) have filed a novice application on Friday 8th February, 2019 late in the night around after 9pm and parties were served on Saturday, 9th February, 2019 and were asked to come to court on Monday 11th February, 2019 for hearing of the application. Senator Marafa recently accused Governor Yari of plotting to destabilise the 2019 elections in the state. In a statement sent to Legit.ng, Senator Marafa specifically said the governor plans to use 8,500 armed youth under guise of civilian Joint Task Force (JTF) to carryout the act. According to him, frustrated by his inability to force his preferred governorship candidate on the APC, the governor announced the recruitment of 8,500 civilian JTF members, camouflaging to end killings and kidnappings.